Home > Health Issues > When is the Best Time to Mediate? Many people claim that they find it best to meditate in the morning. Spiritually speaking, the time before sunrise is often felt to be the point at which one can attain a closeness to the Earth, to God or to the universe. From a Western point of view, the morning is the time of day that is quietest and therefore most appropriate for meditation. Additionally, meditating in the morning will in vigour you for the day ahead. 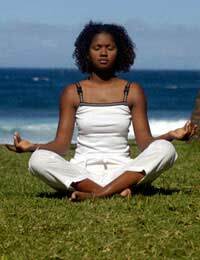 Many people also claim that meditation can be undertaken successfully at night, shortly before going to sleep - the night is also relatively peaceful and a good session of meditation should ensure a good night’s sleep, something that is essential to general wellbeing. Depending on your situation, either morning or night time meditation may work for you. For example, if you work nights, you are likely to be too exhausted to meditate in the morning and too busy to meditate at night! With this borne in mind it is worth taking into account your daily routine and finding a time that best suits you. If in doubt, you can experiment with a number of different times before finally settling on one that is ideal. Meditation is a good thing, if done properly, at any time of the day and it really is important to do it at the time most suitable for your lifestyle; any other time will simply be less effective! It is good to meditate to a regular schedule, preferably daily and at the same time. This will make it easier to focus as your specific chosen time of day starts to naturally feel like a time for relaxation. For this reason it is worth being careful in choosing your time; if you have a sporadic work pattern or busy social life, choose a realistic schedule, if necessary meditating just 3-4 times a week. It is imperative that you do not set yourself goals that you cannot attain as this will create feelings of failure and despondency, thus hampering your ability to relax fully. As it is unwise to meditate under the influence of caffeine, drugs or alcohol, it is worth both restricting and cutting down on their use, whilst planning your schedule to avoid your meditation clashing with activities that are not conducive to naturally clearing the mind. As there are certain environmental conditions conducive to good meditation it is worth planning your schedule so that these conditions may be met. If you want to meditate to music (see related article), do so at a time which is appropriate for those who live with or around you, and have your music to hand. If you require the use of a certain room or certain props, such as cushions or prayer beads in order to meditate it is worth leaving them all in specific place and in order as you finish your meditation session daily. Such practice will help to build discipline and focus your mind. Above all, remember that meditation should be relaxing, so do your best to create a relaxing time and environment in which to undertake the process. This should never be over rigid and whilst you should be careful to stick to routine as far as possible, don’t fret if you miss a session, start late, or cut a session short. If any such disruption occurs, merely ruminate that this was the nature of that particular session and put it down to experience!